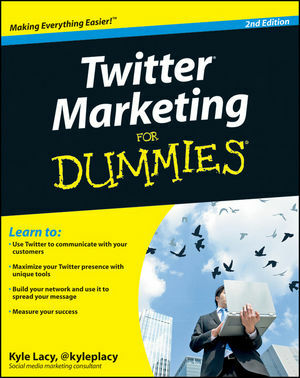 There is amazing site that VERY clearly explains twitter. Being a techie, I learned a long time ago… To truly know a technology, app, machine, piece of software, etc…. Teach it to someone else, someone who isn’t a techie. Along those lines (speaking from experience) To be a guru… teach it to your mother! Here is a article/blog/site that does EXACT that! Twitter is an online social networking tool in which users post 140 character updates of what is going on in their lives along with links to things they think are interesting, funny, or useful to their followers (“following” being essentially what “friending” is on other sites). People use twitter in many ways, some as a newsfeed by following prominent people or networks, some as a pseudo-chatroom by limiting their followers and whom they follow to close friends and family, and some as a microblog for updating people about the work they are doing and their personal lives. Read the whole article by Jessica Hische (@jessicahische) Great writing Jessica! I get asked alot the question about which smartphone is the best. iPhone, Blackberry, or Android. So here are my thoughts. The irony of course is the fact I don’t even have a smartphone. I have a very basic completely devoid of features, Sony Ericcson. For calling features I go even lower tech! No caller ID, no voicemail (even tho it seems like if you call me), and no mobile browsing. Greed…… « Moxie Mom Confessions. A great piece of writing by a talented blogger. There are some things I just don’t understand. Nuclear physics. How people like sushi. How to get the Saran Wrap to actually stick. Tonight I was asked “Why do I hate microsoft so much?”Well it isn’t that I hate microsoft per say, it wasn’t all that long ago I was a MS shareholder. And for a long time I was a frequent attendee at any and all MS events I could get into. For the longest time I would always be using (and pushing the) the latest and greatest for MS.
Then three things came together to change everything! First, even with the latest and greatest from MS, I was having increasing computer problems….crashes, viruses, malware, popups, etc… And more and more I was discovering features would not work. Sometimes they weren’t even features, just the claimed (by MS) benefits that I (as a user) would reap and make my computer usage new and exciting! In the end it didn’t happen. I would discover that some additional (and expensive) piece of software was needed. Like Exchange to use the best features of Outlook. Or the feature sounded great but would have little use to an individual. Like Document Collaboration in Word, best used in a Fortune 500 environment. The second thing was programming. I tried very much to program and web development using MS technology and tools. However I kept finding they had overly complicated everything. Look at embedding an ActiveX component in a web page vs embedding flash. Or connecting a database in ASP vs PHP. The third thing. Once I took a look at the open source world I realized there is a better way. Not only have I found the software to be better. The philosophy of open source makes way more sense then the MS way. No one ever buys MS software. You effectively rent it. And under VERY restrict terms. The way MS uses EULAs, copyrights, and patents just isn’t right. Just image what the world would be like if we used the same model for applying intellectual property rights that we use for software to everything else. Taking in to consideration the statutory life of a patent relative to the life cycle of a piece of software. Ford Motor Co. wouldn’t bother building cars, they’d just be licensing the assembly line. Only GM cars would have seat-belts. All telephones would be made by Bell. Libraries couldn’t exist. How dare someone think of buying just one copy of a piece of copyrighted work. And then sharing amongst a community! And what about schools and their textbooks? Oh well! Schools and libraries haven’t contributed much to society! Who needs them as long as Bill Gates gets his royalties. The philosophy of open source, may be great from an academic view point, but what about the reality? Well the software is just simply better. In the twenty or so machines I either own or am the sole tech support for… When all was MS based I had to deal with an average of 1000 infections per week! Most didn’t cause any damage because I religiously ran virus/malware/spyware scanners. It was happening with multiple firewalls in place. Then I made one small simple change…. I locked down two programs from being used, Internet Explorer and MSN Messanger. Replaced them with alternatives, Opera and Gaim. From that point on I have NEVER had to deal with more the two infections in one single week! Most tech-savy computer users I know have half their task bar filled with notification icons for different security/virus scanning/firewall software. I saw one once were with no open/running apps, just the desktop… 18 out of 40 processes were security related! That’s a HUGE allotment of system resources allocated just to security! They make it so simple, and they are great at selling you on the reasons why you need the insurance. One little check box and a signature on the credit/mortgage application and BANG! you’ve just bought one of the worst forms of insurance! As far as I’m concerned, a complete waste of money. Even worst then the wasting of money… The false sense of security you get thinking your family will be taken care of if something happens to you, when in fact odds are they will get screwed! I truly believe having insurance to cover your debts is essential if you have any family or dependents. Family/Dependents + Debts = Need for Insurance! Of course anyone who knows me, knows I work in the insurance industry and compete against the banks. So why believe me? Don’t! Watch this CBC Marketplace documentary about banks and the insurance they sell. As Erica Johnson reports, the bank staffers selling mortgage insurance are unlicenced and rarely trained to explain the details and legalities of those insurance products. The result is people who pay premiums and think they are covered, only to realize later that they are not. The semi-technical explanation of what happens is this: Let’s compare the process between real life insurance and mortgage insurance. When you go to get real life insurance, you sit down fill in a long application that asks you many personal and intimate questions about your life. Often you have to go thru some form of medical. Anything from, pee in a cup, all the way to full on dissection (or at least it feels that way)! Assuming you are insurable, you pay your premiums, and did not lie on your application (You’d be surprised at how many people do, or try)… You’re insured! IF you die, they pay, that simple. Now mortgage insurance… Check a box, sign and date, maybe fill in a few yes or no health questions… and your insured! Kinda. Almost always there is no underwriting done when you apply for the insurance. Instead they do what’s called Post Claim Underwriting. Meaning they dont really decide if you qualify until AFTER a claim is made. That’s good time to find out you cant get insurance! Post-Claim Underwriting: Unlike individual life insurance, credit insurance sold through the bank is usually not underwritten until a claim is made. This means the insurance company may determine you are not eligible for a payout even though you have been paying premiums. For instance, a claim may be denied because an investigation of your medical records indicates you once had high blood pressure or high cholesterol that you did not disclose. Underwriting: When you apply for individual insurance through a licensed insurance broker your medical history will be examined before a policy is issued and you start paying premiums. The insurance broker will ask detailed questions and may arrange for a nurse to conduct a physical. You will know upfront whether or not you are covered. Standard premiums: The mortgage insurance policy sold at the bank is a one size fits all policy. This means everyone who qualifies is considered to be of equal risk. The premiums you pay on mortgage insurance are a fixed amount based on your age and the amount of your mortgage. There is no discount for non-smokers or for women. The premium does not reduce as the mortgage is paid down. Individual premiums: With an individual life insurance policy, the premiums you pay are based on your individual risk. Your health history and exam will help to determine how high or low your premiums are. Non-smokers and women pay a lower premium. The face amount of the coverage remains level. Decreasing payout: The Mortgage insurance sold at the bank covers a decreasing amount. While your premiums remain the same the amount left on your mortgage decreases. Mortgage insurance will only pay off the balance of your mortgage when you make a claim. Fixed payout: When you purchase an individual insurance policy you pay premiums for a pre-determined amount of coverage. Therefore, if you pay premiums for $100,000 of coverage your beneficiary will receive $100,000. The bank gets the payout: Mortgage insurance is designed to pay off the bank if anything happens to you. Therefore the insurance payout will be made directly to the bank. You choose who gets the payout:With an individual policy you are free to choose the beneficiary or beneficiaries. If something happens to you, it is up to your beneficiaries to decide what to do with the insurance proceeds. via 5 Ways Coupons Can Be Bad – TheStreet. BOSTON (TheStreet) — Your supermarket doesn’t love you. And the folks who make the pasta, peanut butter, cola and condiments you buy don’t really worry about helping your household budget. Those who deal in coupons do so to make money, not to cut you a break. While it can make good financial sense to save a few cents here and there by clipping and downloading coupons, companies provide that service as a means to get you to spend more, and if you don’t think through your purchases using coupons can end up costing you in the long run. Boiling it down, manufacturers have key goals when it comes to consumers — they want more of them, buying more, more frequently. Coupons allow them to maintain and build upon their market share, draw first-time buyers into the fold, ease the blow of price increases or size or quantity reductions, and push stores to offer prime shelf displays and aisle placement. Research by NCH Marketing Services, part of the media and marketing services company Valassis(VCI_), found that shoppers saved $3.7 billion with coupons last year. You can read the complete article here, but I have to warn you, thestreet.com website is slow and bulky. A Little Math: The Cost of Transportation. Alex Pope has written a great blog entry on the cost of local transit projects. Anyone who lives in the Vancouver Lower Mainland and either drives or pays property taxes should read this! Great work Alex! There is lots of discussion and complaints recently by various parties about taxation for the purpose of developing transportation networks. Depending on their point-of-view, there are people who support or complain about one or more of highway, transit, and cycling projects. A lot of financial information has been publicized but I haven’t seen any comparison of what these projects will cost in real dollars out of my pocket. So I thought I would do a little bit of math and share the results. I’m going to purposely ignore inflation and interest payments in these calculations to make them easier to follow – just recognize that the results of the calculations are estimates in today’s dollars. Where I have needed population estimates, I used the 2010 population estimates that I found in this document (pdf) on the Metro Vancouver web site. 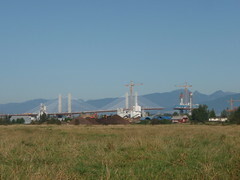 The first transportation project that springs to mind is the Golden Ears Bridge. The “Capital Cost” for the bridge was $808 million which we will be paying over 35.5 years through a usage toll, which just increased on July 15th. So this year, someone who is commuting by car (at $2.90 per trip) twice a day (based on 200 workdays in a year) will pay $1,160.00 in tolls. Read the whole posting A Little Math: The Cost of Transportation.